Introducing the new ATM Champions! 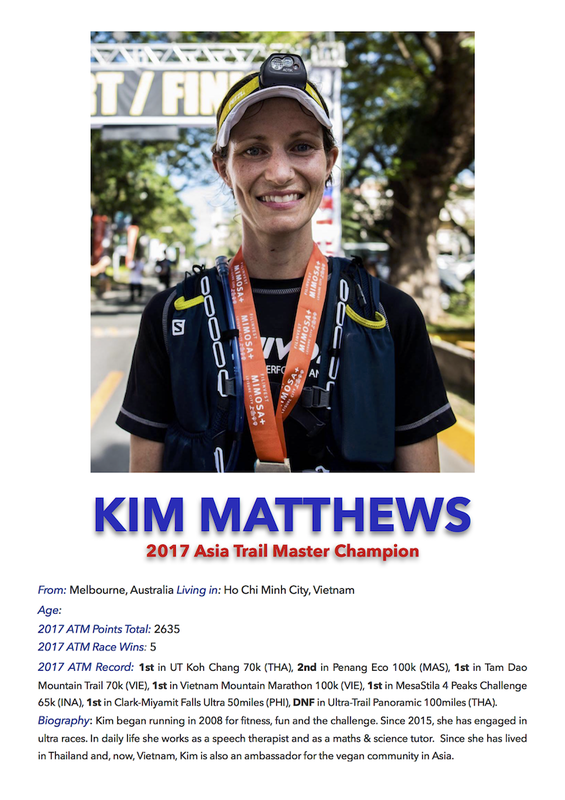 The 2017 Asia Trail Master season is a wrap and we are very happy to announce the following two runners as our new Champions: Steven Soonseng Ong from Malaysia and Kim Matthews from Australia. Both excellent trail runners held off the charge of previous champions Manolito Divina, Arief Wismoyono and Tahira Najmunisaa Muhammad Zaid, respectively. Ong crowned himself last weekend by winning UT Panoramic in Thailand, while Kim already had the title assured before last weekend's race as Tahira is still in recovery and could not start. Below a few key details about our new champions! The 40-year-old Malaysian impressed everybody this year with his intelligent approach to ultra races that resulted in four big wins. In his last one, Ultra-Trail Panoramic in Thailand last weekend, Ong came back from third place to catch the two front runners in the final 60 km. Not only is he the new Asia Trail Master Champion, he is also a real "Trail Brain" ! Born in Victoria, Australia, Kim has since lived in Thailand and since recently Vietnam. A runner for nearly ten years, she is also an ambassador for the vegan community in Asia. We got to know her this season as a woman who goes beyond the limit to reach the finish - especially when it was hot and humid. Kim Matthews is a well-deserved Asia Trail Master Champion and successor to Tahira Najmunisaa Muhammad Zaid! Congratulations!! ATM Finale in Japan and Thailand bound to be a thriller!